When you make a sale on Poshmark, we provide you with a pre-paid, pre-addressed shipping label. No stamps. No hassle. Now that’s what we call PoshPost! Our partnership with USPS allows you to use Priority Mail, Priority Flat Rate & Priority Regional Rate boxes. Although Express Mail boxes are not allowed! You can also use a regular brown box to ship your items, just make sure you remove any previous labels before shipping. Did you know you can request FREE boxes from USPS? They’ll even drop them off at your house! We recommend adding a special touch to your #PoshPackages. Wrap your item in tissue paper and include a personalized note to thank your buyer. 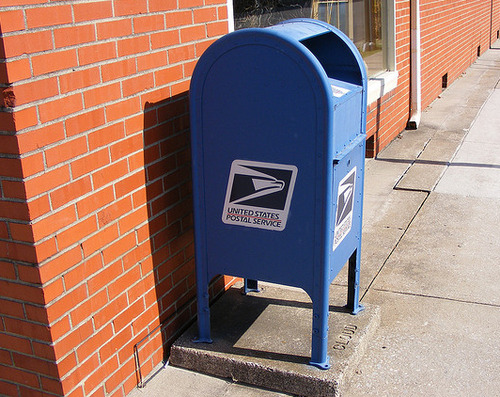 Drop your package in a blue mailbox, if the package fits. Schedule for a pick up via the USPS site. Easy! Hi, can a medium box fit a blue mail box? How do I ship a package to a customer? ? Why can’t you use a usps flat rate box? Hi Natalie, Priority Mail and Priority Mail Flat Rate are two different types of mail within USPS. The labels that Poshmark uses are Priority Mail. I accidentally used a priority mail flat rate box to ship an item, what do i do? Hi Michelle, please reach out to support@poshmark.com and they can help you directly. Thanks! Can I use shipping envelopes or does it have to be shipping boxes? Hi Melissa, you can use shipping envelopes as long as they protect the item well. I have brown envelope with bubble wrap aligning the inside that I’ve bought from Walmart. Can I use that and securely tape the shipping label I received from poshmark on it? Hi Kayla, that should be fine as long as your item is likely to be secure until it reaches its destination. Hi, if you have a shoebox are you allowed to securely tape it shut and ship your item off in that? Hi Mo, we recommend this only if the shoes are securely padded inside. If the buyer had requested the box, or that was part of the selling point, we recommend you use a secondary box. I used a regular brown box that I paid for & I had to buy a stamp cause i couldn’t print it out, I was told that it was going to get a different tracking number anyways. Did I do it wrong? HI Engelica, please reach out to support@poshmark.com as this was shipped outside of our system. Next time, know that you don’t have to pay for boxes as Priority Mail (not Priority Mail Flat Rate) boxes can be ordered for free from USPS. It’s also best to use the shipping label provided. I’m super new with this app so when I get a notification that says a person has added your item to a bundle what does that mean exactly? Hi Sabrena, it simply means that someone is considering creating a bundle from your closet. No action is required on your part. You’ll be notified if the buyer completes a bundle purchase via push notification and email confirmation. Someone bought an item from my closet that I have lost and they said that they were charged with the fee, but yet I haven’t shipped anything so I just don’t really know how this works. How do they get a refund? Hi Lizeth, you can drop off a package with the shipping label at any USPS location or in the USPS blue drop boxes. Please wrap all items securely and in a box or envelope. If you’re using boxes or envelopes from the Post Office, please ensure they’re Priority Mail and not Priority Mail Flat Rate. Does the box have to be plain brown, or can I use a box I already have? Hi Juliana, you can use a box you already have as long as it’s in good condition and will get the item safely to the recipient. Hi Jessica, please note that our Posh Protect policy does not cover trades within the system. When payment for the full value of items is not exchanged through the Poshmark system, we cannot guarantee that both parties will ship their items to each other as promised or as described. Trading is based on an honor system and is difficult for us to support. For this reason, we discourage users from trading on Poshmark as they are not protected. Can I use a plain plastic shipping envelop to ship clothing? I have used these with Vinted and there was no problems. I just want to make sure it’s okay through poshmark as well! Hi Ashley, yes, you can use these envelopes to shop your items as long as the items are secure and protected to withstand the journey to the recipient. What do I attach the shipping label on with? Would just taping it on be fine? Hi Madison, we recommend using packaging tape to cover and attach the full label, so it won’t be damaged in shipping. I’m still not understanding bundles and I am also wondering why people do not want PayPal? Hi Paris, it may still be shipped OK, but please reach out to support@poshmark.com just in case. Thanks! Hi Denise, please print the shipping label provided at a library or other place that provides printing services. That way we can better handle it within our system. Can I use a priority mail flate rate box? And also how many days do you have to ship it within? Hi Noosha, Please use just a Priority Mail box, not Flat Rate, as it’s a different class of mail according to USPS. You need to ship an item within 7 days. Happy Poshing! Hi can I drop off my sale using regular priority box sending it via the ups store? Hi Theodhora, Please use the USPS shipping label included with your sale and drop off at the Post Office or in a blue USPS drop box. The shipping label doesn’t work with other mailing services. I have someone that purchased two items from me and you sent me two separate mailing labels. Can I ship both items together and use only one label to get credit? Can I ship the item in a bag? Like a Nasty Gal shipping bag? Hi Mila, please package your item not only with care so that it will be protected as it reaches its destination, but also how you would want to receive an item as a buyer on Poshmark. I want to send fragrance mists is that a problem ? Hi Denise, unfortunately perfumes are not supported for sale on Poshmark. For more help, please reach out to support@poshmark.com. How do I ship overnight (per customer’s request)? Hi Taysha, currently we only offer Priority Mail 2-3 day shipping options. Please reach out to support@poshmark.com with any questions. Hi Isabel, Our contacts at the USPS have again confirmed that USPS blue boxes are acceptible for handling Priority Mail, which is the class of mail used for Poshmark labels. If you have any questions or concerns, please reach out to support@poshmark.com. Can I use a padded envelope for small items? Hi Alex, yes, as long as the item is packaged securely to reach its destination with care. 2. Can I affix the shipping label to ANY priority mail box size? 3. Are all items $5 to ship, including large items like a huge wedding dress? Are the priority mail boxes free at the post office too? I ordered some but they are taking a while to get here. I wanted to know if I was to sell something before they get here if I would have to pay if I were to just get one at the post office? Hi Jennifer, you can use another shipping box that you may have at home or pick one up for free at the Post Office. What happen I loose the item I sold and the buyer got charged your fees how do you return there money ? Hi Rosie, please email support@poshmark.com for direct assistance.